In this update I am covering the work I have done to the Main Entrance Junction and the Cargo Bays since the last update I wrote. There are only 15 snapshots to look at this time because there just wasn’t much detail to show because the majority of the work was already done. Since the last update I decided to finish the engineering section before writing any updates and because of that there are 110 images in this post all related to the Engineering Section. Matched the colors of the suspended catwalk to the catwalk in the Landing Bay. Changed all the wall panels to the utility wall panel design. Widened the rear tower to accommodate the Reactor Core. Designed and modeled Reactor and fuel storage tanks. Designed the Power Distribution Unit, power conduits and power consoles. Created ceiling lights based on Landing Bay. Designed Water Treatment Plant and Trash Incinerator. Merged the small controls rooms with the main room eliminating doors. Added computer consoles to room and created standing wall computer consoles. Designed the main computer racks and created moving maintenance platforms. At the end of the last update I said I would start finishing the corridor sections. I started to do that but then I got distracted and I began working to complete Landing Bay instead. In this update I will cover the work done on the Helm Section of the ship so far. The majority of the work was done on the pilot stations including the computer consoles, flight controls and the pilot seats. It might not seem like much but the work done here will be reflected in nearly all future computer consoles and work stations on the ship. I am looking to make a unified design across the ship. Because the ship is intended to be new and in unused condition, there won’t be a mismatch of parts from different ships and manufacturers like the heavily worn and used ships like the Millennium Falcon or the Tantive IV. That’s it, I’ve done it again by failing to write an update for a long time! Because of this I will be splitting the progress of the ship into two updates. In this update I will go over the progress of the Bridge interior and the next one to follow will be on the Helm. It was about time that I started to work on the interior of the ship for a while. I decided on working on the Bridge which is one of the largest sections of the ship and possible the most highly detailed one. This is a short update because it involves just one big change: the escape pods. As I mentioned before, the escape pods were starting to bug me and the reason is that the entry doors are just too big to be swung open into the inside of the ship. Because the doors took up so much space when opened, I had to compromise the design of the escape pod launch rooms to accommodate them. I wanted the escape pods to match those on the Tantive IV and at the same time match the general design of the escape pod access ports inside the ship. That was just not possible to do with the design of the escape pods seen in the movie. To get the launch rooms designed to my liking I decided to compromise on the design of the escape pods themselves. 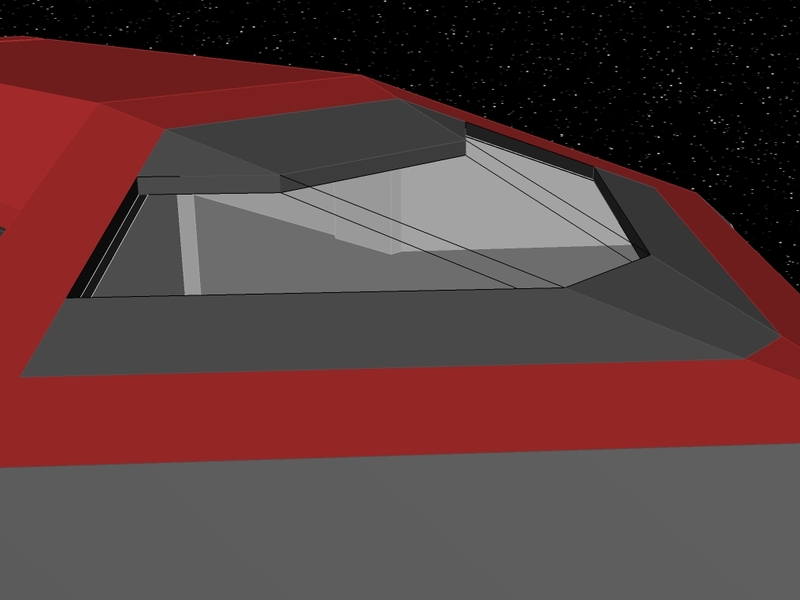 After working on the Bridge section for a while I felt the need to work on other parts of the ship. This project may seem scatterbrain, but that is because it is. To prevent boredom I have to move on to something else to keep my creativity going. Typically those who design stuff like this sketch it out on paper first and make several revisions before they even start creating a prototype model let alone the final 3D model or a physical model. That method probably makes the most sense but in my case I am completely digital and it’s out of necessity. Once again I did a lot of work on the ship without writing one of these updates so there will be 2 updates. In this update I am focusing on the designing of the front entrance of the ship, the front landing gear and the main docking rings. In the next update I will be covering the rear landing gear, the buildup of the primary weapon and a few exterior details. The docking ports on my 210CR starship have bothered me since the day I modeled them because it was hard to make heads or tails out of the images of the Millennium Falcon’s docking ports that I could find at the time. The main problem is that nobody seems to know how they work and without a better photo it’s impossible to tell. But since I modeled the docking ports I was able to get a great close up when I went to the Star Wars Exhibit last May. Still, even with the close up I wasn’t sure how they worked but I was able to make out all of the details on the model. As I about to model the docking ports on my new starship project and it made me do some more research on the web to finally figure out how they work on the Falcon. Somebody came up with the theory that there are 6 small doors that open inwards with the center section attached to the top one. Finally it seemed to make sense. The inner doors are supposed to open inwards as well but the detail on the model simply doesn’t allow them to. So, now that I had an idea about how they worked, I decided to completely redo the docking ports on the 210CR. To make them function I had to use a little artistic license and decided what certain parts would do. I made the parts that surround the doors a locking system that would hold the doors shut magnetically. Magnetism should be enough because the air pressure behind the doors would pretty much keep them shut in the vacuum of space. The inner doors were the only parts that opened before but now, in contrast, they no longer open. Someday this will bug me and you will see another update like this one. The new docking ports are now part of version 1.1 of the model and can be downloaded on the starship’s page.